Outstanding flavor, and so good for you! 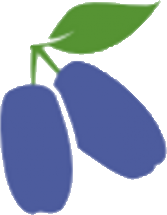 The fruit of the lonicera caerulea (“blue honeysuckle”) has been enjoyed in northern Russian and Japan for centuries, and is an exciting new crop for US growers and gardeners. Several superior varieties have recently been developed from Japanese stock, subspecies emphylocalyx, and we offer a few which have been developed by plant breeder Dr. Maxine Thompson, Professor Emeritus, from Oregon State University. Read more about the differences between Russian and Japanese cultivars here. The blue, oval berries have a flavor that is a tangy blend of raspberry, blueberry, and currant. The skins are tender, and the seeds are small and unnoticeable. They are ready for harvest early in the season, ripening in most locations at about the same time as strawberries. The uses of haskaps are as varied as any other berry: pies & crisps, jams & chutneys, ice cream & smoothies, salads & sauces, wines & liqueurs. The nutritional value of haskaps is exceptional. They are known in Japan as the "berry of long life and good vision." Haskaps are extremely high in antioxidants, surpassing black currants in their powerful array of anthocyanins, polyphenols and bioflavanoids. We ship dormant, bare root plants. Send us your inquiry, and we will work with you personally to answer questions and fulfill your order. Learn more about our superior varieties for US growers and gardeners.